The Green Organic Dutchman (TSX: TGOD, TGOD.WT) released it’s third quarter financials yesterday. Within these financials, as is standard for the current earnings season, is an enhanced look at the biological assets currently in inventory. Industry followers will recall that this is related to a notice published last month by the Canadian Securities Administration. This notice that was published identified the abuse that the licensed producers in the cannabis industry are getting away with when it comes to identifying the fair value of biological assets. As a remedy for investors, the association provided some clarification on what information must be published by public companies so as to prevent misleading investors. Some firms have taken this to heart and greatly increased their level of disclosure, while others have conducted the bare minimum to avoid potential penalties. To their credit, The Green Organic Dutchman is one of those firms which appears to have gone over and above in their level of disclosures. This however may come to haunt them, as the numbers identified clearly demonstrate that contrary to popular belief, they are in fact not the lowest cost producer in the sector. In fact, they’re a far cry from being the market leader in this category. 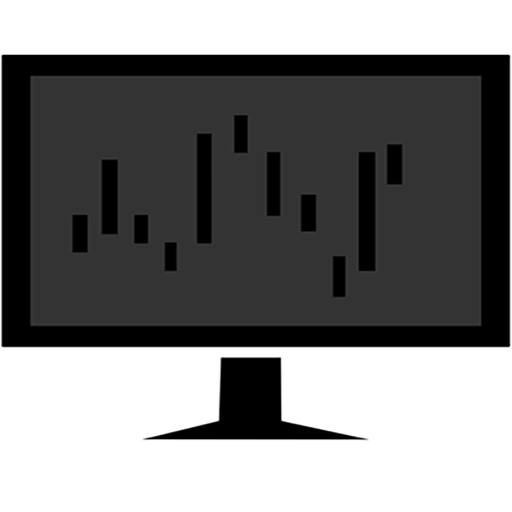 The Deep Dive and Harvest Moon Cannabis Co. (Operated by @BettingBruiser) have teamed up to breakdown this claim, as well as to provide a new resource for the cannabis industry to be released shortly – a quarter by quarter breakdown of cannabis production costs on a per gram basis of public licensed producers. Stay tuned. 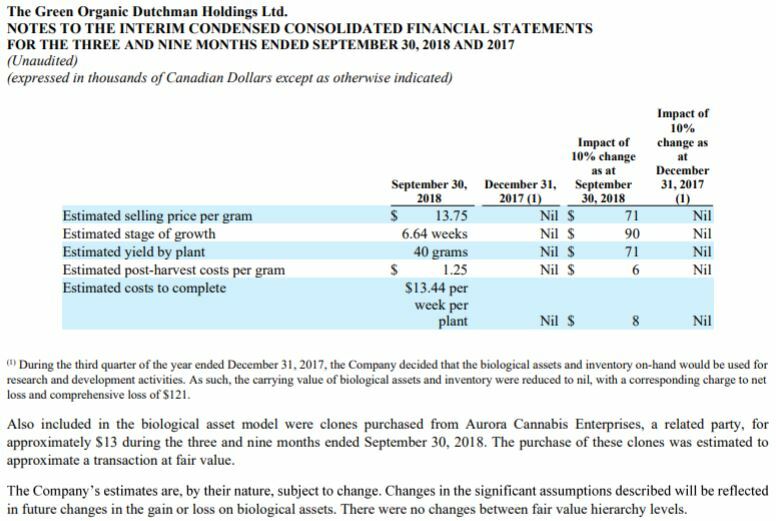 Although missing from the latest edition of the investor presentation, The Green Organic Dutchman has long touted the claim that they will be among one of the lowest cost producers within the Canadian cannabis landscape. They’ve accredited this claim to the agreements they have established with the Government of Quebec as well as that of Eaton Corp, a power management company. However it appears that the company has recently backed away from that claim quietly, which was almost a requirement with the disclosures made in the recent financials. 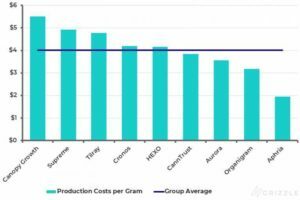 The figures released by no means identify the company as a low cost producer – in fact, production costs are higher than the average price per gram in which Hexo Corp sells their product. Bulls of the company will be quick to point out that this is a result of their two major facilities not yet being online. At this point in time however, the Hamilton facility is still stuck growing potted mums until council reverses their decision to deny the application for development, or the company successfully appeals the motion at a higher level of office. Until that point in time, TGOD will be unable to grow any cannabis at the Hamilton expansion. 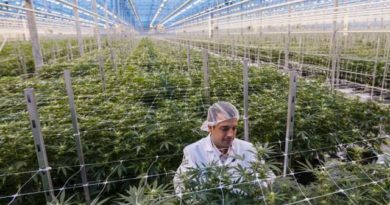 In the case of the Valleyfield Quebec facility, it is still close to a year away from completion, less the time for the facility to be licensed by Health Canada. TGOD Cost of Production – Sourced via November 13, 2018 filings. Within the financials, the Organic Dutchman provided figures that indicate the cost of production for the producer is quite high relative to peers – even if organics is taken into consideration. The filings indicate that the cost per plant per week for production is $13.44. At a stated average yield of 40 grams per plant, this equates to $0.336/gram for each week that each plant is in production. The Green Organic Dutchman also indicated that each plant takes an estimated 12 to 16 weeks for production. Utilizing our cost per gram per week figure, this gives us a range of $4.032 to $5.376 for the total cost per gram of production. Due to the variance, we’ll settle on the average figure of $4.704, which represents an estimated production time of 14 weeks. There are a few figures which are left out of this equation however. The disclosure identifies that the plants came from clones rather than from seed. These clones were purchased from Aurora Cannabis, at a price of $13,000. It doesn’t identify how many clones this represents, so we cannot accurately include the figure in our cost per gram calculation. In turn, this means that post-harvest cost per gram figure actually needs to be added to the production cost per gram of cannabis to be able to identify all costs incurred on a per gram basis. These two figures together will give The Green Organic Dutchman a total cost per gram from production to sale of $5.954. Again this does not include the cost of the clone itself, thus it is not a seed-to-sale figure. How does this compare to other industry players? To make a comparison, we’ll utilize a chart provided via Grizzle.com, which is believed to utilize figures from the previous quarter of production that have since decreased over time. As can be seen, even if we were to remove post-harvest costs per gram in our equation, The Green Organic Dutchman is still one of the highest cost producers in the sector. This should be expected given the nature of organic production – the belief that an organic operation would also be the lowest cost operation in the sector is simply foolish. The current round of earnings season has just begun. This cycle has proven to be eye opening given the enhanced disclosures that are required of companies in the sector due to the notice issued last month. Due to these disclosures, we’re now also aware that the average selling price from Hexo Corp, a Quebec-based competitor, has receded to $4.66/gram. Not only is this representative of the loss that TGOD might experience on a per gram basis, but it also tells us that while power may be cheap in Quebec, consumers expect those cost savings to be passed onto them as well. This thereby eliminates the perceived competitive advantage that growing in the province of Quebec has. Certainly, organic cannabis may fetch a premium. However, The Green Organic Dutchman appears to be confused on that perceived premium. Within the filings, it listed an estimated sales price of $13.75 per gram, before the retailer markup or any amount of taxes are added to the equation. 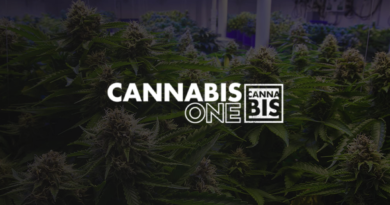 However, its investor presentation published this month states a figure of $12.30 as the organic average – with no indication of whether this is a recreational end-consumer price, or if it is based on a medical cannabis figure. Whichever the case may be, consumers may have a hard time justifying paying three times the price for their cannabis than the neighbours located next door. Information for this briefing was found via Sedar, TMXMoney, Grizzle, Aurora Cannabis, and The Green Organic Dutchman. The author has no securities or affiliations related to this organization. Not a recommendation to buy or sell. Always do additional research and consult a professional before purchasing a security. The author holds no licenses.